Retractable awnings can transform previously-unusable outdoor living spaces into your personal oasis. Retractable awnings can transform previously-unusable outdoor living spaces into your personal oasis. Whether you love spending time outside or want to extend your living space outdoors during the warmer months, retractable awnings have a lot to offer your home. Here are some of our favorite benefits of retractable awnings. Outdoor furniture and outdoor décor can all fade when exposed to intense sunlight for long periods of time. Without a retractable awning, the investments you’ve made in your beautiful bright outdoor furniture and deck can be lost to the summer sun. Retractable awnings are only out when you want them to be, so you can extend it during the warmest and brightest parts of the day and put it away for a comfortable evening on the deck. Your deck and patio are there to help you fully enjoy your outdoor living space. However, if you are squinting into the sun the entire time, how much enjoyment are you really getting out of the equation? A retractable awning will help you to spend more time outdoors reading and doing all of the activities you enjoy. You can enjoy shade and relaxation at all hours of the day, regardless of what the sun is doing in the sky. Unlike permanent awnings, which cannot be taken down whenever a thunderstorm or severe weather event rolls through, retractable awnings can easily be put down. As a result, retractable awnings have a much longer lifespan. You will never need to be concerned about your awning getting ripped, twisted, or torn from wind, hail, snow, ice, or rain. Retractable awnings can last for a great deal of time with only regular maintenance. 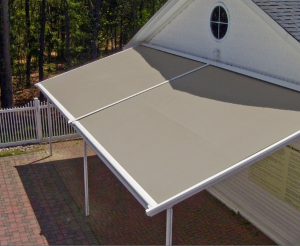 While permanent awnings are still a gorgeous addition to your home, retractable choices are the best option for homeowners wanting reliability, durability, and flexibility. Ready to get the perfect awning for your apartment building, business, or home? Carroll Awning Company has the expertise and equipment to make and install the perfect residential or commercial awning to give your home or business an even cooler exterior. We can design, create, and install custom canopies and awnings all year long. For a free estimate and to get started designing your dream awning, give us a call at 1-800-999-5617 or visit us online. To see examples of our work, follow us on Facebook, Twitter, Google+, and LinkedIn.